Walking through the rhododendron forest. If you are looking for a wonderful vacation in Naturally Nepal in a bargained price yet consisting of amazing hospitality, natural as well as cultural artificial attractions then Langtang Valley Trekking would be the ideal choice. Backpacker takes you to the amazing Langtang area consisting of high altitude lakes, waterfall, Tamang heritage trail and unique Tibetan-Nepalese community.Langtang Valley trek starts by the bus ride to Syaprubeshi, Rasuwa from Kathmandu. The Langtang trekking would be the mesmerizing experience in terms of the surprising animals, birds and the terrains that you encounter while roaming around the region. However, the dangerous animals are rarely encountered but still the sight of the national bird of Nepal Daphe (Lophophorus),Rhododendron Forests, Monkey and wild cats would be the enthralling experience.The region boasts the vibrant feeling of remoteness and peace yet being so near to the Kathmandu. The nearest trekking route of Nepal excites you with the diverse package of downhill and uphill trail witnessing the birds, animals, forests,rivers and mountains. The Gosainkunda Lake itself embarks the landmark high altitude natural water reservoir. The wilderness and the fear of unknown while trekking on the faded trail would give your adrenaline the test on perseverance and excitement. The sacred lake for both Hindu and Buddhist followers shows you the exemplary lesson on the religious harmony among Nepalese people. The lake itself symbolizes the sacrifice for the cause of goodness. Lord Shiva once drank the poison extracted from the Sea in order to save mankind who were about to get vanished by the poison. He felt enormous pain and stroked on the hills of Gosaikunda eventually forming the source of water for the Lake. The water he drank made him neutralize the pain and poison. Therefore, the lake is the symbol of eternal peace and sacrifice. Every year thousands of tourist domestic and international pay visit to this sacred place. For the unique experience of religion, harmony and nature the Langtang trek is highly recommended. Day 02 Drive from Kathmandu to Syabrubeshi(1460m).-6 HoursWake up at early in the morning. Have a breakfast at the lodging. Appreciate seven our picturesque drive through Trishuli Valley with towns, stream, and mountains. You will become to at Syabrubeshi (1,420m) around 2 or 3 o'clock. Whatever remains of the day is free. Day 03Trek from Shabrubeshi to Lama Hotel(2560m).-8 HoursToday after breakfast your trek starts. You start your walking at your own pace and the trail ascends for around two hours through the forest followed by a climb of about an hour to reach Bamboo village (1,850m/6,068ft) where you'll stop for lunch. This forested path with well-stabilized trails and following the upstream and can be seen birds life around the bushes. Bee hives hanging on a cliff are another attraction for the visitors. From here you will again steeply climb through the bamboo forest to reach the Lama Hotel (2560m) where you'll rest and overnight at a local teahouse. Day 04Trek to Langtang (3307m) Duration: 5 hrs Trekking Trail follows Gumanech ok, Ghoda Tabela . After this the trail is slightly gradual up and beautiful view in the valley with the grazing Yaks. Langtang village is one of the local and old villages along this trekking route and the view from here is more mesmerising. Day 05Trek to Kyanjing gompa (3700m):4 Hours At starting climbs gradually Passing the Laja Khola then climbs a moraine to a viewpoint where you can look Kyanjing Gompa and the dramatic icefall flowing from Langtang Lirung. After Kyanjing Gompa, hiking to Kyankin Ri (4773m) and trek back to Kyanjing Gompa. 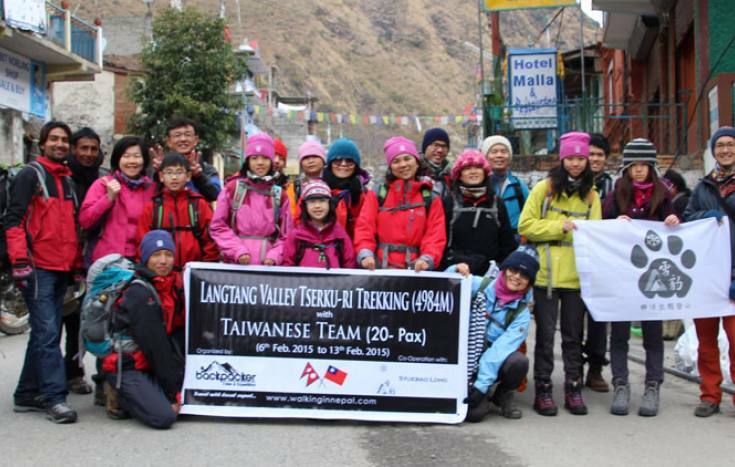 Day 07Trek to Lama Hotel (2500m) Duration: 5-6 hrs we back all the way downhill to Lama Hotel. We will see spectacular views of the snowcapped mountain Take more time and you are suggested to walk very slow. Day 10Departure to TIA “Farewell!you will return to your country via the international Airport in Kathmandu.